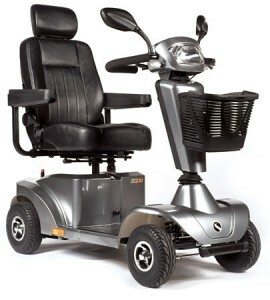 ﻿ Sterling S400 | Powered Wheelchair Rental from 12 Euros a day! Looking for a compact, 4mph mobility scooter with big features? Then look no further than the S400. Highly manoeuvrable around shopping centres and equally at home on busy high streets, the all-round suspension as standard ensures that those bumpy drop kerbs when crossing the road are a thing of the past. Plus with the bright, energy efficient LED’s lighting your way, you’re just as visible on those late-night shopping trips as you are during the day.